Juan Williams actually used to be one of my favorite journalists. 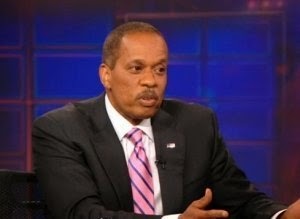 Of course, that was the Juan Williams I like to call "BBO" [before Barack Obama]. The Juan Williams "ABO" [after the election of Barack Obama to the presidency in 2008] has become one of the most, if not the most, annoying Obama sycophants in a list of many from the main stream media. These sycophants, like Juan, have thrown away any pretense of fairness in discussing their hero, Barack Obama. It's not just that their objectivity goes out the window when talking about president Obama, they will actually lie for him, to cover up his faults and scandals that are happening in his administration. The biggest lie, in my opinion, told by Juan is when Juan challenges those that call president Obama weak on foreign policy and not a leader, by saying "president Obama must be doing something right and is a strong leader because he has kept Americans safe [on American soil] in his 6 years as president". He will say because of the president we have not been hit again. I have heard Juan say this on talk radio, on "The Five" on the Fox News Channel, on the Bill O'Reilly Show, on Sean Hannity's TV show, et. al. What is almost as distrubing as Juan Williams saying this big lie is that no one ever challenges him on it. 1. November 5, 2009: Islamist Nidal Malik Hasan committed a terrorist attack on Ft. Hood, Texas [near Killeen, TX] brutally shooting American heroes there. He killed 13 people: Michael Cehill, Librardo Caraneo, Justin DeCrow, John Gaffney, Frederick Greene, Jason Hunt, Amy Krueger, Aaron Nemelka, Michael Pearson, Russell Seager, Francheska Veley, Juanita Warman, and Kom Xiong. He also injured [many of them severely] 32 more Americans. Sickeningly, president Barack Obama never has admitted that this was a terrorist attack and still to this day calls it an act of workplace violence. That does not give Juan a pass on his lie, because every honest thinking person with an ounce of intelligence knows that this was a terrorist attack. From my post: President Obama Hides Islamic Link To Terrorism "There was clear evidence that Hasan was in communication with al Qaeda leader Anwar al-Awlaki prior to the attack. Also, witnesses to the terrorist attack said that Hasan was yelling "Allahu Akbar" as he was shooting these heroes." So, just this one case proves that Juan Williams defense of president Obama's foreign policy and strong presidential leadership, that he has kept Americans safe, is a lie. But this is not the only case. 2. Dec. 14, 2010: The "Fast and Furious" sickening gun running operation run by the United States ATF under the Obama administration resulted in one of those weapons delivered to the hands of the Mexican drug cartels, killing US Border Patrol Agent Brian Terry in Arizona. I will agree that this is not a terrorist attack, but Juan Williams cannot discount this scandal when he says that president Obama has kept Americans safe in his 6 years as president because of his policies. 3. Sept. 11, 2012: While the Benghazi [Libya] terrorist attack did not occur literally on US soil, because this happened to an American Ambassador at a United States of America diplomatic compound, it is considered to be the same as if it happened on American soil. What happened? : Islamic terrorists on the anniversary of 9-11, stormed the US consulate in Benghazi, Libya, in an obvious well pre-planned attack and killed Ambassador Stevens, Sean Smith, Tyrone Woods, and Glen Doherty. Ten other Americans were injured in the attack. 4. April 15, 2013: The Islamic Chechen Tsarnaev brothers committed a cold blooded terrorist bombing attack at the Boston Marathon, killing three: Krystie Campbell, Lu Lingzi, and Martin Richard, and injured 264 more. Some of those injured were so severely injured, like losing limbs and eyes, etc. their lives will be forever changed tragically. Juan, not even president Obama has denied [finally] that this was a terrorist attack-there is no denying that it occurred on American soil. There is of course, the recent attack in Oklahoma of a Muslim, speaking Arabic during the attack, cutting the head off a woman, a la Islamic terrorists around the world, but giving the president every benefit of the doubt, all the facts aren't in, so I won't even include that in the list of not keeping Americans safe [from terrorist attacks] on American soil. And even if I would discount #2 above, since that was not a terrorist attack, and #3 above, because that did not occur literally on American soil [in the United States] the Fort Hood and Boston bombing terrorist attacks committed on American soil by Islamic terrorists, have led to 16 dead and 296 injured Americans. That is a fact! Juan Williams, try looking those parents and family and friends of those killed and severely injured in those terrorist attacks and telling them that president Obama has kept Americans safe on American soil from attack during his 6 years as president. That is the Juan Williams big lie and I wish just one time, when Juan Williams repeats this lie, that at least one of the conservatives on the panel or the interviewer would challenge Juan on this lie. I agree, why doesn't someone call Juan on it? Not with partisan but with FACTS?